In this guide you’ll learn how you can watch all of The Boat Race online from anywhere in the world in just 6 simple steps. The Boat Race is one of the most exciting events of the year and even if you’re not usually a fan of rowing the action between Oxford and Cambridge makes for tantalising viewing. Unfortunately, depending on where you are in the world, you could find that you’re unable to watch The Boat Race. With this guide you’ll be able to watch The Boat Race online from any country in the world and in just 6 simple steps. The Boat Race is being shown live by the BBC on BBC One. If you haven’t seen it before the BBC has a very good online streaming service known as BBC iPlayer. Here you can access all live events and catch-up TV and The Boat Race is no exception. All you need to do to watch The Boat Race online in the UK is to head over to BBC iPlayer where you’ll be able to watch the entire event online. You’ll need to create an account on the BBC website and before playing anything click Yes to confirm you have a TV licence. If you’re outside the UK and you want to watch The Boat Race then your options can be extremely limited. Most countries don’t show the event on local TV. Thankfully you can also access BBC iPlayer like British viewers by following the steps below. 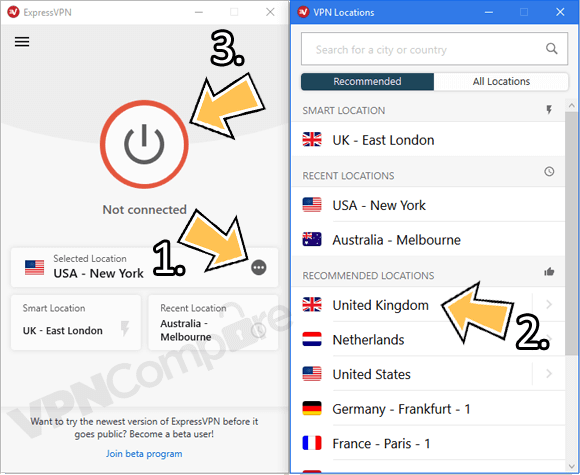 You’ll need to get yourself a VPN app which allows you to alter your online location and make it appear as if you’re somewhere else. In this case, make it appear as if you’re in the UK. The steps below show you how to do just that. Install the app, run it and login with the account details you created when you signed up. Select Choose Location (1) and then United Kingdom (2). If it doesn’t automatically connect, press the Connect (3) button. Once it’s connected visit the BBC iPlayer website and enjoy the race. Watch The Boat Race with ExpressVPN. You can now watch the entire The Boat Race event from any country in the world. When you’ve finished watching simply press the Disconnect button and your connection returns to normal. * It’s best to watch The Boat Race on a Windows or Mac computer or laptop because you don’t need to download any additional apps. If you try to watch on a mobile or tablet outside the UK you’ll need to already have the BBC iPlayer app installed on your device. The Boat Race is held every year and this year will take place on April 7th, 2019. Live coverage on the BBC starts at around 2:00 pm and runs until around 6:00 pm. Both the Men’s and Women’s event are taking place on the same day this year on the same course so you’ll be able to watch both events and all the pre-race build up and conclusion afterwards. The event will start in New York, US and Toronto, Canada time at 10:00 am, in Sydney, Australia at 01:00 am the following day and 03:00 am in New Zealand also on the following day. The Boat Race is probably the biggest sporting event in rowing between two teams in the world. Each year the prestigious universities of Oxford and Cambridge from England take part in a boat race. Although it sounds rather la de da paddling on the river it is anything but. This is a powerful and fierce battle between two of the top universities with the top rowing teams. Rowing has something quintessentially English about it, but this race is anything but relaxing. These two hardened teams battle it out to be crowned the winner and it’s hard fought right up until the very end. The race takes part on the famous River Themes and is fought over a 4.2 mile stretch of the river (6.8 km). The first race was held way back in 1829 so the history of the event is huge. Cambridge currently holds the most victories with 83 wins over Oxford’s 80. It’s a close call and with Cambridge winning the 2018 race they’ll be eager to close that gap even more. The teams often called the Dark and Light Blues compete for no monetary prize, they take part for nothing more than bragging rights at being the best. Even though it is a typically English event the Oxford team is made up of British, South African, American, German and British-Greek members. The Cambridge team feature a large portion of American members plus British, French and British-Bermudian-American-Iranian members. If you’re in the UK you can simply pop onto the BBC iPlayer website and watch without any issues. You’ll need to make an account if you don’t already have one. If you’re outside the UK you’ll need to get yourself an app called a VPN that makes it appear as if you are in the UK. You can download one using the link below. All you need to do then is follow the 6 simple steps earlier in this guide and you can watch the entire Boat Race in any country in the world. Ready to watch The Boat Race?